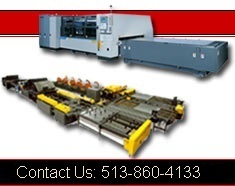 Roper Whitney sheet metal fabrication equipment | Cincinnati Precision Machinery, Inc.
Roper Whitney was established in 1910 as a manufacturer of sheet metal fabricating machinery, punch and dies, and handtools. Roper Whitney's manual floor and bench brakes compliment their complete line of CNC operated folders. The Roper Whitney Autobrake and Roper Whitney Gemini Folders are offered in numerous lengths and gauges with many different back gauges from 40" to 10' U & L shaped sheet supports. Shears are also offered in manual or powered configurations in a variety of sizes. Quality, dependability, and service brought to you by Roper Whitney, the professional's choice. Contact Us About Any Of This Roper Whitney Sheet Metal Fabrication Equipment !